Will water lead to an India-Pak war? My article Will water lead to an India-Pak war? on the strategic consequences of global warming is posted on in Sify.com. Click to read. The purpose of President Sarkozy' visit to China (his fourth one) is not very clear. He is probably keen to show the First Lady the Great Wall and the terracotta warriors at the tomb of China's first emperor in Xian. Interestingly (though not directly connected), The News in Pakistan in an article, The French dis-connection attacks Paris for canceling a large arm deal: "France, true to its traditional double dealing, duplicity and equivocation, put on hold the provision of $1.6 bn contract for provision of JF-17 Thunder aircraft parts." The commentator speaks about US pressurizing Paris. He says: "any technology provided to support the JF-17 Thunder aircraft fighter might be pirated across to China". Even without the US 'pressure', Paris is not so confident that the aircrafts to be sold to Pakistan will not go through a 'reverse technology process' in the Middle Kingdom. Though Pakistan obviously does not believe in this scenario as: "China has crossed requisite technological barriers much earlier to be categorised as a dependable supplier of weaponry to the world. The latest demonstrations of China’s newest aircraft, J-10, in front of defence attaches is a testament of its technological ascendancy in the region", it remains however a concern in France. Of course, Hu will not broach the topic with his French counterpart. About a 'new page', one can doubt. BEIJING, April 28 (Xinhua) -- Chinese President Hu Jintao said Wednesday China-France ties have "opened a new page" as French President Nicolas Sarkozy pays his second state visit to China. At a joint press conference with Sarkozy in Beijing, Hu told reporters he had accepted Sarkozy's invitation to visit France "at a time convenient for both sides." Hu and Sarkozy held about 50 minutes of private talks before starting their formal, large-scope talks which Hu described as "candid, friendly and productive" and reaching "many important agreements." Sarkozy arrived in Xi’an, capital of northwest China's Shaanxi Province, Wednesday morning to begin his three-day state visit. It is Sarkozy's fourth trip to China and his second state visit as French president. He paid his first state visit to China six months after taking office in May 2007. He attended the opening ceremony of the Beijing Olympic Games and took part in the 7th Asia-Europe Meeting held in Beijing in 2008. To further upgrade the China-French comprehensive strategic partnership, Hu made a four-point proposal at his talks with Sarkozy. Hu said China hopes to work with France to maintain high-level exchanges and dialogue and consultations on major issues of common concern. Hu also suggested both sides boost pragmatic cooperation. He said in addition to cooperation in traditional fields, the two sides should actively promote cooperation in energy saving, environmental protection, new energy, agriculture and farm produce processing, and among small and medium size businesses to seek long-term, stable and reciprocal common development. The two countries should strengthen cultural exchanges, facilitate language education, two-way travel, and dialogue between each other's media and think tanks, Hu added. He said China and France are expected to together meet local and global challenges to achieve a peaceful and stable international environment, citing reform of the international financial system, improving the global economic governance structure and coping with climate change. Hu told the press conference he and Sarkozy agreed to keep in close consultation on global issues and to conduct active cooperation to solve international and regional disputes by peaceful means. He said the Chinese side sets a high value on the role the EU play in international affairs and appreciates the constructive stance taken by the French side in promoting China-EU relations. When meeting the press, Hu noted France is the initiator of the reform of the global economic governance mechanism. Hu added China supports France's holding of next year's G20 summit. France will hold the presidency of the G20 summit this November and host the 2011 summit. Sarkozy said France is willing to work closely with China to ensure a successful summit. He said that China is a very important strategic partner of France and they both need to cooperate closely on major global issues such as pushing economic growth, and maintaining world peace. He said there is only one China in the world and that Taiwan and Tibet are both part of China. This is the policy France has been adhering to since the France-China diplomatic ties were established in 1964. There is no change in the policy. He said France is willing to work with China to further beef up cooperation and exchanges in fields including peaceful use of nuclear energy, aviation, transport, environmental protection, finance, agriculture and culture. 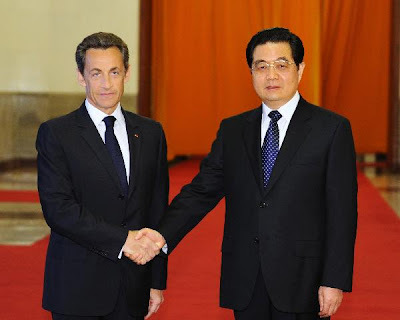 After talks with Sarkozy, Hu said he will visit France at the invitation of Sarkozy. As a guest of Hu, Sarkozy is paying a state visit to China from April 28 to 30. He kicked off the visit in Xi'an, capital of northwest China's Shaanxi Province. He will attend the opening ceremony of the Shanghai World Expo on April 30. India is an incredible country. 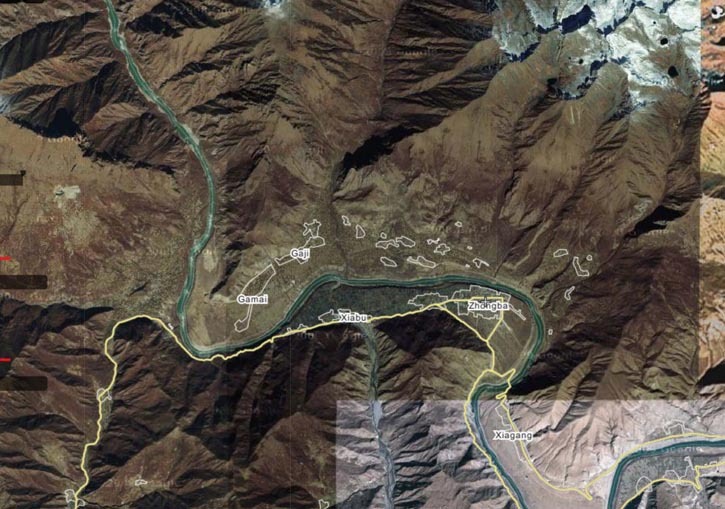 The Government says that they have finally got some satellite pictures of the dam being build in Zangmu on the Yarlung Tsangpo (Brahmaputra), while since several months, one can find pictures of the construction on the Net. When the Chinese say that the damming (5 dams are being planned, see my earlier posting) will have no consequences for India, most Indian 'experts' agree. There was recently a talk at the United Service Institution of India in Delhi with the Indian 'Expert' arguing that even if the Brahmaputra is diverted, it will only be a mere 30% of its waters which will be lost to India and Bangladesh, with no consequence for these countries. It is frightening. In the meantime, Pakistan is laughing. On Thursday, External Affairs Ministry spokesperson Vishnu Prakash said, in response to a media report, that India will be trying “to ascertain whether there are recent developments that suggest any change in the position conveyed to us by the government of China”. You can't help but laugh! if india builds dam and don't give a DAMN about it's neighbour's (Pakistan) water supplies and needs, then why should China care for india then. NEW DELHI: China has assured India that the dam it is building on the Tsang Po river in Tibet for generating power would not affect the water flow of the Brahmaputra. External affairs minister S M Krishna told Parliament that China had given this assurance during his recent visit to Beijing to mark 60 years of diplomatic relations between the two countries. “It is a fact that when we met in Beijing, the question of the power station did come up. The Chinese foreign minister assured me that there would be no water storage at the dam and it would not in any way impact on downstream areas,” Mr Krishna said during question hour in Rajya Sabha. The minister was responding to a supplementary question from BJP leader Ravi Shankar Prasad on the impact of the Chinese dam. Chinese activity on the Tsang Po river, which is the Brahmaputra in India, has caused a lot of concern in India, particularly in Assam. India and China exchange hydrological data, but have no separate mechanism on dealing with water sharing issues. However, New Delhi seems to be somewhat reassured by Beijing’s assurance on the dam project considering this is the first time it has even admitted activity on the river. But, Bharatiya Janata Party (BJP) member Kumar Deepak Das pointed out that the dam is a 450-mw hydroelectric project and could not be labelled a small project. In response, the external affairs minister merely said “with reference to trans-border rivers, we have an expert level mechanism to address the issue. A meeting of experts from both India and China is scheduled to take place from April 26-29 in Delhi and the issue will be discussed in it”. In spite of the Chinese assurance, India is expected to continue keeping track of China’s activities on the river. The Brahmaputra, which is 2,906-km long, starts in Tibet and weaves through India and then through Bangladesh. The China stretch is 1,625 km, while the next 918 km is in India and the remaining 363 km in Bangladesh. When asked about the dam project, foreign secretary Nirupama Rao also said that the Chinese side had assured India that the project would not in any way divert water. “This would not a be a project that would divert water... It is not a storage dam for irrigation purposes,” she said on the information given by the Chinese side during the bilateral discussions. The external affairs minister pointed out that India has concerns about the boundary issue. “There are concerns over the boundary question. It has been our policy that a fair and mutually acceptable solution to this is needed. Our special representative has held 13 meetings with his Chinese counterpart on this and the 14th meeting is scheduled soon,” he said. Professor Robert Thurman is a well-known figure in the United States. 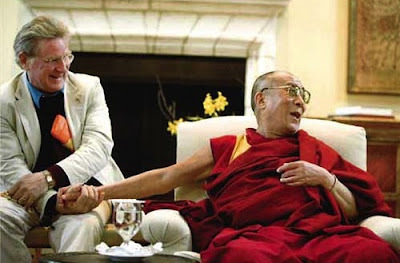 Not only because a few years ago, he was nominated as one of the 25 most influential Americans by Time magazine, but also for being a senior scholar at Columbia University, one of the Dalai Lama's oldest supporters and Hollywood beauty Uma Thurman's father. He speaks to Claude Arpi about as diverse subjects as his years when he was a monk in north India in the 1960s, his relations with the Dalai Lama (Thurman's latest best-seller is entitled Why the Dalai Lama Matters), but also of 'capitalist' China, the Buddhist wave in the West, his idea of a Second Renaissance, his work for preserving Indian sastras at Columbia University, the Barack Obama-Dalai Lama encounter and his vision for the future of the planet. Year 2012 will be a special year. Not only because it will be an Olympic Year or the last year of the Mayan calendar, but also, perhaps more importantly, because the future of China will become clearer. In 2012, the 18th CCP Congress will elect new members for the Central Committee, the Politburo and its Standing Committee (PBSC); a large proportion of the current members are due to retire being 65 years old or more (seven out nine PBSC members will have to say bye to active political life). The Fifth and Sixth-Generation cadres will then take over. Already analysts are speculating on the composition of the Gang of Nine which will rule over the Middle Kingdom till 2017; and this, at an extremely crucial time for the survival of the one-party system. He pointed out one of power struggles currently going on: technocrats vs Party cadres. However some other commentators see a great deal of jockeying between the Communist Youth League faction and ‘princelings’, respectively led by President Hu Jintao and Vice-President Xi Jinping. Others speak about the importance of the Shanghai clique (of former President Jiang Zemin) or the all-powerful People’s Liberation lobby. One can only make wild guesses about the direction in which the white smoke will go during the fall of 2012. Will the wind blow to East or West? It is a one-billion yuan question. Some water was recently added to the speculation mill when Wen Jiabao, the Premier of the State Council wrote an editorial in the People's Daily, the CCP mouthpiece; he penned an unexpected tribute to Hu Yaobang, the reformist (and disgraced) former Secretary General of the CCP. Let us not forget that it is Hu’s death which triggered the Tiananmen protests in 1989; it ended in bloodshed still not acknowledged by Beijing. In his editorial, Wen emotionally describes trip to southwestern China that he made in 1986 with Elder Hu (not a relative of the current President): “Comrade Yaobang's sincere, approachable, smiling face constantly appears before my eyes, and in my heart the cherished feelings [that] I've put aside for so many years flood in like a tide". Considering that Hu Yaobang has not been fully rehabilitated after he sided with demonstrating students in 1986, the praise is rather surprising. Wen admits that he remained in close contacts with Hu, even after his disgrace. He also reveals that every year since Hu’s death, he has visited Hu's home during the Lunar New Year holidays. Jing Huang, a professor at the National University of Singapore's Lee Kuan Yew School of Public Policy, told the Wall Street Journal that Wen’s editorial indicates that the reformists may have "prevailed in a struggle over conservative forces and reached a new consensus” for political reforms. For him “Hu Yaobang is the perfect person to highlight the importance of political reform as well as the Party's leadership in the reform." Some other China watchers believe that Wen is just interested in the image that he will leave behind after relinquishing power. Whatever is the truth, the most startling aspect is that Wen’s article was published as an editorial of the People’s Daily, showing some kind of consensus at the top of the Party. This reminded me that in 2008, I had written an Open Letter to Premier Wen Jiabao. I doubt if he ever read it, but I wanted to put on record that, if more reform-minded leaders would appear on the Chinese political scene, it would create a tsunami of change in the Middle Kingdom. I reminded Wen that when he was Director of the General Office of the CPC Central Committee in May1989, he walked down with Zhao Ziyang to meet the youth striking on Tiananmen Square. Zhao told the youth: “I have to ask you to think carefully about the future.” The students were given assurance that “all issues could be dealt with in a proper manner”. In 1980, under the leadership of Hu Yaobang, a historic visit to Lhasa by the CCP Working Group on Tibet took place. Wen was then posted in nearby Gansu province. While in Lhasa, Hu Yaobang gave a powerful political speech to some 5,000 cadres. The motto was “Strive to build a united, prosperous and civilised new Tibet”. He was probably sincere. 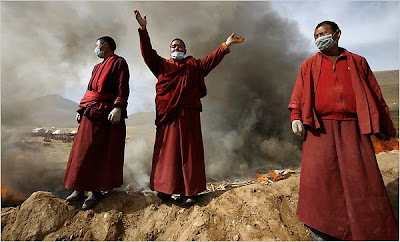 After the powerful earthquake which devastated the Gyekundo region of Eastern Tibet (Qinghai province), the Dalai Lama said he was eager to visit this province where he is born. Even if a trip does not materialize immediately, the Chinese Premier should instruct his Ambassador in Delhi to invite the Tibetan leader to the Chinese embassy for a cup of green tea and have an informal chat. Would it not be the best way to start healing old scars? Premier Wen would then be truly faithful to his mentor Hu; further it would bring China a good image, which it badly needs today. Pakistan has become hysterical again. This time it is not about Kashmir, Islamabad has found a new issue: water. According to the Pakistani media (and politicians), New Delhi has started a ‘water war’ against Pakistan, having decided to ‘starve’ the country of its due share of water. Pakistan’s de facto boss, General Ashfaq Kayani stated that India will remain the main focus of his nation military doctrine so long as the issues of “Kashmir and water were not solved”. And at the end, there is always a veiled threat: the ‘water war’ may trigger a ‘nuclear war’ if Delhi does not listen to Islamabad and Pakistan’s American sponsors do not immediately ‘restrain’ India. Dr. Arvind Gupta in an IDSA paper entitled Vicious anti-India propaganda in Pakistan on Water issues lists some of the pearls of wisdom found in the Pakistani press and in the mouth of Pakistani politicians. This last comment is the most significant, “Kashmir is not as important as the water issue”. Retrospectively, the motivation of Jinnah for ‘recovering’ Kashmir in 1947-48 was perhaps not the Two-Nation Theory, but the waters of the State which were (and are) an existential issue for the Land of the Pure. Hafiz Muhammad Saeed, the Lashkar-e-Tayiba founder (and mastermind the 2008 Mumbai attacks) added to the hullabaloo by asserting that the next war between India and Pakistan would be fought over water. Saeed called on the people of Pakistan to stand united against India. It has been forgotten that since 1960 the Indus Water Treaty has been able to legally deal with all water issues facing India and Pakistan. The ‘water war’ gimmick is only orchestrated by the Army which finds that to keep Pakistan ‘together’, the best way is to point a finger at the ‘eternal’ enemy, India. However a new element will soon come into play: Climate Change. This is not going to improve the relations between the two neighbours as the water scarcity will soon be real. It does not augur well for the future of the subcontinent. He further explains: “It has been accepted that the loss of the Sarasvati played a role in the dissolution of the Harappan city states. Why did this remarkable civilisation with its excellent town planning, standardised writing and weight system suddenly collapse?” He adds: “Scholars believe that the Sarasvati river system disappeared creating a domino effect on other settlements”. My point is that climate changes have occurred in the past and will occur again in the future. Though today Pakistan is screaming without factual basis, water wars are looming large on the horizon of the subcontinent. It could bring about tremendous strategic changes in the region. In view of today’s hysteria of our neighbouring, the past Sarasvati scenario is quite frightening. Traditional strategic studies look at national boundaries between Nation-States as the prime triggering factor for most tensions/conflicts. War often originates from ‘historically non-defined’ (or at least not accepted) borders, i.e. Pakistan’s claim over Kashmir or China’s of Aksai Chin or Arunachal, but in the case of climate change the source and consequences are far beyond national borders, making the issues more complicated to grasp and eventually to solve. The only way to tackle these global issues is through consultation and collaboration; ‘global’ solutions have to be found. In this respect, it is unfortunate that most of India’s neighbours do not understand the meaning of ‘collaboration’. The strategic issue does not concern India alone. Take the Mekong and the severe draught currently experienced in the Indochinese peninsula. The 4,350 km river has its source on the Tibetan Plateau. It flows downstream to the Yunnan province of China, Myanmar, Laos, Thailand, Cambodia and Vietnam. Chinese experts assert that Tibet contributes 20% only the Mekong's waters. The remaining 80% are fed from water sources in downstream countries. Now China has built several dams on the upper reaches of Mekong without consulting its neighbours. This year, the draught has been so severe that the cargo traffic on the river has stopped, affecting the lives of 65 million people in the peninsula. Though some environment scientists claim that the lack of rainfall alone is responsible for the low level of the river, a group of affected countries — Myanmar, Laos, Cambodia and Vietnam — met in Thailand to discuss this hot issue. When Panitan Wattanayagorn, a Thai government spokesman asked Beijing for "more information, more cooperation and more coordination", China immediately denied any wrong doing. Environmental NGOs in the peninsula however blame China for ‘drying’ the Mekong and provoking the crisis. China, a dialogue partner of the Commission took the ‘attack’ seriously and sent a delegation led by Vice-Foreign Minister Song Tao to the two-day conference in Thailand. Liu Ning, the Chinese Vice Minister of Water Resources affirmed that the dams and irrigation projects upstream have actually helped stave off some of the effects of drought and Foreign Ministry spokesperson Qin Gang further stated: "China attaches great importance to developing good-neighbor, friendly and cooperative relations with these countries in its commitment to dialogue, communications and cooperation". Whatever it is, there is no doubt that climate change is going to provoke similar tensions and conflicts elsewhere in Asia in the future (mainly thanks to the Chinese dams!). Global warming will probably radically change the face of the planet in many ways. A recent report No Place Like Home published by The Environmental Justice Foundation, a UK-based NGO states: “Every year climate change is attributable for the deaths of over 300,000 people, seriously affects a further 325 million people, and causes economic losses of US$125 billion. Imagine tens of millions of ‘migrants’ having to leave Bangladesh! Where would they go? It is not difficult to guess: to their hospitable neighbor, creating serious disturbances in the North-east. Who is thinking about this in Delhi? 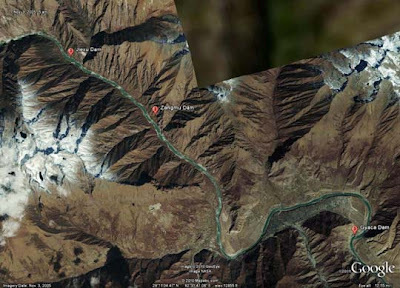 For India, there is another serious issue: the diversion of Tibet’s rivers towards China. Beijing’s problem No 1 in the years to come will be how to feed its 1.3 billion people, for which water is needed. The only solution to save China is to divert the water from the South to North. The water diversion project was already mentioned in The Draft Outline of the Tenth Five-year Plan for National Economic and Social Development (2001 2005). According to the 10th Five-year Plan, water should be diverted from the South via three channels in the eastern, central and western regions, respectively. For us in South Asia, the main concern is the Eastern Diversion. The perennial run of the rivers originating from the Tibetan glaciers also results in a stable flow of water to regions which are dominated by monsoon rainfalls (with rain pouring for only a few months of the year). Consequently, the Tibetan rivers, independent of seasonal precipitation patterns, are an important factor in sustaining hydrological regimes of South Asia. As in the case of the Mekong, the Chinese deny any wrong doing on the Brahmaputra though the work to dam the lifeline of Assam and Bangladesh has started. 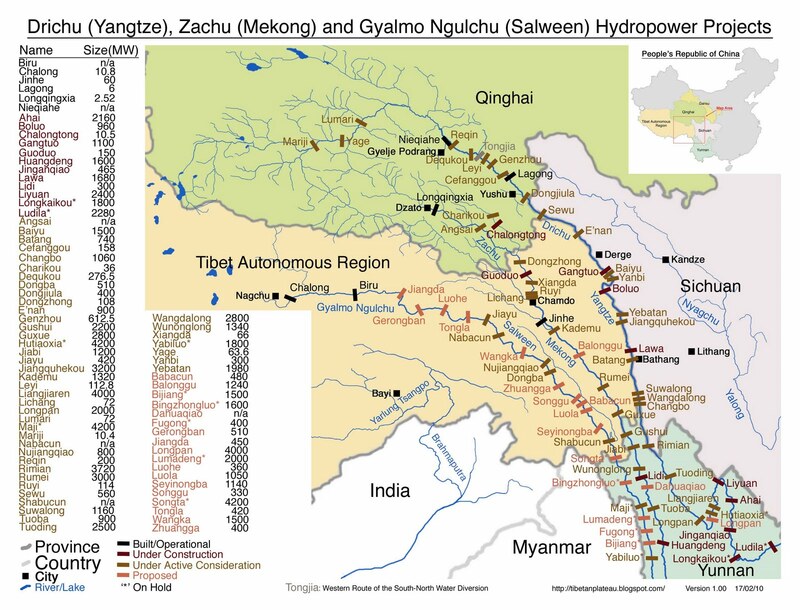 Last year, the Gezhouba Corporation, one of China's largest engineering companies, was awarded a $167 million contract to build the Zangmu Hydropower project on the Brahmaputra, north of Arunachal Pradesh. The project is expected to be completed in December 2015. It will be followed by a string of 4 other dams in this sensitive area. While their Pakistani counterparts are vociferous about non-existent ‘water diversion’ in India, the South Block diplomats remain very shy to strongly take the matter with Beijing. These issues are bound to increase with the melting of the Himalayan glaciers and the climate change on the “Third Pole”, as the Tibetan plateau is also called. And contrary to the drying of the Sarasvati, this time the catastrophe will be man-made. In the 1960's, the PRC partitioned Tibet. Nearly two third of the Tibetan territory became part of the provinces of Qinghai, Gansu, Sichuan and Yunnan. As a result, only the Tibetan Autonomous Region is today considered as 'Tibet' by Beijing (though places like Jyekundo, the epicenter of the earthquake are known as Tibetan Autonomous Prefectures - Yushu TAP of Qinghai province). 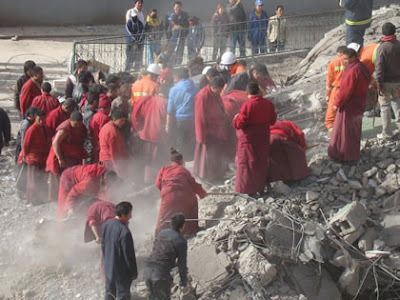 During the first few days after the catastrophe, the foreign media reported about 'an earthquake in China', hardly mentioning that it was in Tibet. The situation was deeply ironic, the earthquake was in China, but the rescuers needed translators (not only in Xining as reported by this article of the People's Daily), but in the spot. The Chinese authorities will not agree to a visit of the Dalai Lama in Jyekundo, it would be an admission that this part of 'China' is in reality 'Tibet'. It was what the Dalai Lama has constantly been asking during the 'negotiations'. As I mentioned in an earlier positing, Beijing may soon be forced to admit the 'partition'. Thirty-eight injured people from Yushu quake area have arrived in Xining on April 15. According to Gong Baocaidan, the vice-director of Qinghai People's Hospital, they have already treated 117 patients from Yushu and they are making every effort to vacate another 160 beds for more patients. When the reporter arrived in the Affiliated Hospital of Qinghai University, a student from Medicine College was waiting outside, hoping he could be a volunteer here. However, the hospital has indicated they are in dire need of Tibetan language translators. Three sets of photos of the earthquake which devastated Jyekundo in Kham province of Eastern Tibet (today called Yushu Tibetan Autonomous Prefecture of Qinghai province by the Chinese). Yesterday, I posted a piece about the People's Daily's article written by Premier Wen Jiabao praising Hu Yaobang. It reminded me that a few years back, I wrote an Open Letter to Comrade Wen. Click here to read. 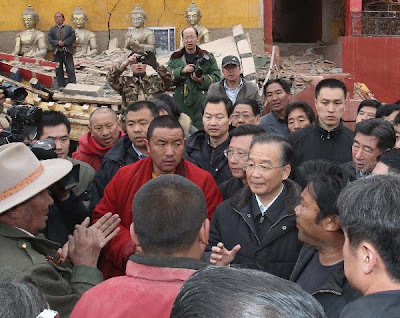 If Wen wants to be truly faithful to Hu Yaobang's memory, he should allow the Dalai Lama to visit the earthquake affected areas of Kham (today Qinghia province). Some Tibetan living in the area have written to President Hu and Premier Wen imploring Beijing to allow the Tibetan leader's visit. Here is the letter. Wish you both good health. During the initial hours of the natural disaster, we appreciate your government’s immediate relief efforts through soldiers and all round support from different sections of the society and we, the victims of this calamity, thank you for the same. But we are a deeply religious community having a strong faith in the teachings of Buddha. Since many generations, we have a deep faith in His Holiness the Dalai Lama. Today, as we are suffering from a great physical and mental anguish, we really need His Holiness to visit the quake affected area to pray for the departed souls and to provide solace to the broken hearts. Today, we request you, president Hu and premier Wen, to find the compassion in your hearts and fulfill this desire of us quake victims. We, the quake victims numbering more than 10,000, implore you from our hearts to temporarily set aside your government’s political differences with the Dalai Lama and kindly consider our request. With this invitation to His Holiness the Dalai Lama, we have no other objective apart from fulfilling our religious aspirations of praying for the departed souls and the survivors of the disaster. In this hour of distress, His Holiness’ visit to offer prayers and condolences in person is the only way to heal our wounded hearts. There is no other better way. It may sound incredible, but the Chinese Premier praised Hu Yaobang, the disgraced former Secretary General of the Chinese Communist Party. The most surprising is perhaps that the People's Daily published the article of Wen. In May 1980, Elder Hu visited Tibet. He is the only Chinese leader to have ever admitted the mistakes committed by the Central leadership on the Roof of the World. Read the report of Hu's visit to Tibet. The People's Daily published an emotional eulogy by Premier Wen Jiabao for late party secretary Hu Yaobang yesterday on the 21st anniversary of the reformist leader's death. 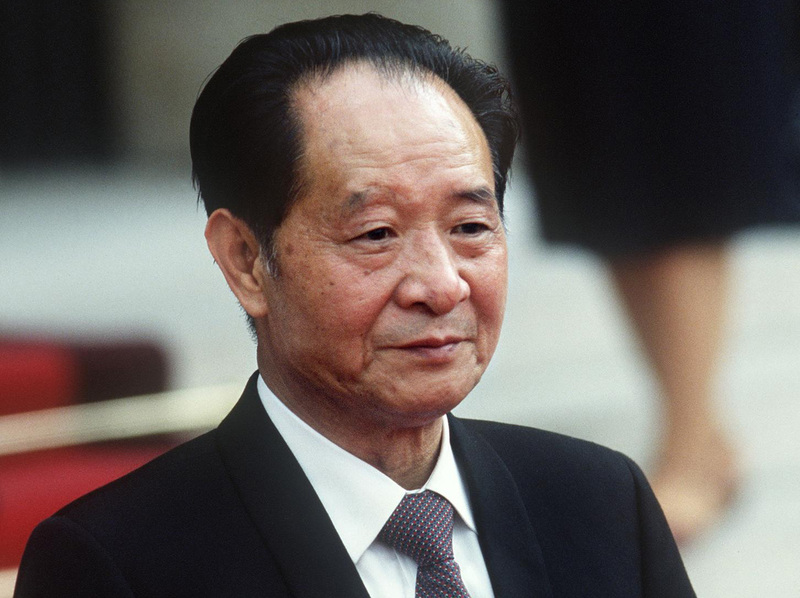 In the surprising eulogy, titled "Recalling Yaobang on my return to Xingyi ", Wen wrote that he modelled himself on the populist Hu and had maintained a close relationship with him after Hu was deposed in 1987. 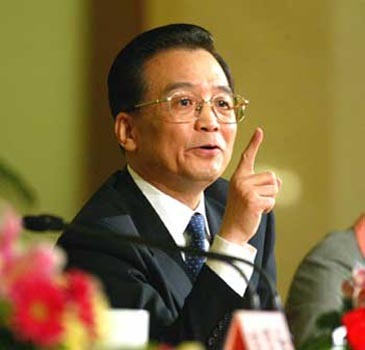 Hu Yaobang was a mentor to Wen and President Hu Jintao. The eulogy raised eyebrows because it is extremely rare for an incumbent premier to write publicly about a politically sensitive figure at a sensitive time - Hu's death sparked the pro-democracy protests that resulted in the infamous Tiananmen crackdown on June 4, 1989. All articles by state leaders are carefully choreographed to relay a political message, especially those in the People's Daily, the party's most important mouthpiece. "This article is unexpected. Since the removal of Hu from his position, which is a tragedy, few dared to speak for him in the media. So Wen's article is a very important gesture, and a good sign," said Bao Tong , secretary to late party general secretary Zhao Ziyang . In a rare revelation, Wen wrote that he often visited Hu after his resignation and had never stopped paying tribute to him in the past two decades. Hu was toppled by party hardliners who held him accountable for a wave of student-led unrest and the spread of "bourgeois liberalism". "After comrade Yaobang no longer held official leadership posts in January 1987, I often visited him at his home," Wen wrote. "On April 8, 1989, when comrade Yaobang was critically ill and under emergency treatment, I accompanied him all along. "On April 15, when he died suddenly, I rushed to the hospital. On December 5, 1990, I carried his funeral urn for burial in Gongqing , Jiangxi , and I've visited his home every Spring Festival since his death." Political commentator Li Datong, a former editor of the China Youth Daily, said Wen's detailed account of his connection with Hu was unusual and intriguing. "It is as if Wen is telling the public what he has done for Hu all these years. It is as if he wants to leave a historical record on this issue," Li said. "It is like a confession; it is very unusual." Li said he believed the article was not the result of a political consensus by the Politburo Standing Committee, nor was it a prelude to the full rehabilitation of Hu's political status. Rather, it showed Wen's disappointment and frustration with the bureaucracy. "Among the Politburo Standing Committee, Wen is in the minority. He always talks about universal values such as freedom and human rights. But none of the others mention them," Li said. During an online question-and-answer session with internet users in February, Wen said he cherished the opportunity to speak to the public because he knew "there were not many such opportunities left". Wen said he decided to write the eulogy after he visited Xingyi, Guizhou, on April 3 during an inspection of the southwestern drought. "When I walked on this land and looked at the mountains and the waters, I could not help recalling the trip when I accompanied comrade Yaobang on an inspection here 24 years ago ... the emotion harboured in my heart rises and falls like the tide, and it cannot be calmed." Wen also gave a lengthy account of how Hu asked him to lead a team of officials and sneak out at night from the guest house they stayed in to get genuine opinions from rural families. Since becoming premier in 2003, Wen, now 68, has been famous for changing the routes of his inspections unexpectedly in order to talk to rural families, away from meetings prearranged by local cadres. "I worked with comrade Yaobang for two years after I was transferred to the general office of the party's Central Committee in October 1985," Wen wrote. "I remember in my heart his teachings in those years, and I dare not become slack about what I learned from his example. His work style has brought immense impact on my work, study and life." The description of how Hu, at 72, insisted on carrying on with the 1986 inspection tour during the Lunar New Year despite ill-health also has parallels with Wen's trips to the countryside. In the February online chat, Wen said he had not celebrated Lunar New Year with his family for the past eight years. Hong Kong-based commentator Johnny Lau Yui-siu said he believed Wen's article was not an individual move but came as a result of a party leadership consensus. However, it was too early to speculate if the party wanted to fully rehabilitate Hu. Lau said Wen's article was more likely a proactive move to assuage rising public anger as the sensitive period leading up to June 4 commemorations usually began on April 15. "Compared with last year, there are more unstable elements in society this year," Lau said. "The government is very worried that these unstable elements, often social and economic problems, will erupt and become political problems. There is a greater sense of urgency this year." Copyright © 2010 South China Morning Post Publishers Ltd. In 2013, you will probably still need an Inner Line Permit to visit the Indian side of the McMahon Line, but if you are really keen to visit the area, you will just have to book a train ticket to Nyingchi (Nyingtri) with the Chinese railways. A railway will be paved between Lhasa, capital of Tibet and Nyingchi, at the earliest in 2013. Project of the Lhasa-Nyingchi Railway is now at the feasibility study stage with two designs going southward and northward under discussion. The experts prefer the southward scheme since it is relatively easier than the other in terms of difficulty of construction. The southward scheme suggests building the railway down by the Lhasa River, going eastward through Gongga, passing by Nedong, Nang, Mailing , spanning the Nyang River and ending in Nyingchi County. The total lenght is estimated at 440 kilometers. The other design with a total length of 330 kilometers proposes to pave the railway along the NO.318 national highway via the Maizhokunggar County, Milar Mountain and Gongbo Gyamda. Lin Shijin, head of the experts group, the most scientific time to build the Lhasa-Nyingchi Railway is in 2013. Slowly, the issue of 'declassification' of archival documents is progressing. One can hope that one day India will become a country like any other countries, not hiding its past behind pretextes or excuses of 'national security'. During a recent hearing before CIC, the commission made it clear that any public authority claiming exemption under Section 8 (see below) will have to demonstrate to the CIC that 'national interest' will indeed be affected due to disclosure. I believe that now all the files with the MEA have been digitalized. It is a good thing. It should not be too difficult to go through these archives and sanitize what needs to be sanitized and declassify the rest. The people of India are entitled to know their history. New Delhi: The Central Information Commission (CIC) will "revisit" the material regarding talks between the foreign ministers of India and Pakistan in 1963 to decide if it can be revealed under the Right to Information (RTI) Act. The decision came on an application filed by veteran journalist Kuldip Nayar who had sought information from the external affairs ministry about the talks between the then foreign ministers of India and Pakistan — Swaran Singh and Zulfiqar Ali Bhutto — in the wake of the India-China war in October 1962. Nayar approached the CIC after the MEA denied the information, stating that it is in "top secret" files and cannot be revealed. Considering the "sensitivity of the information, in view of the ongoing talks between the two nations, the said information could not be divulged at this point of time", the ministry told the CIC. "After hearing the detailed arguments of the parties, the commission is of the considered opinion that the contents of the files (in the eight volumes) need to be revisited to decide whether all or part of the information contained in the said files is sensitive enough to be kept confidential or whether the same can be disclosed under provisions of the RTI Act, 2005," the bench of CIC chief Wajahat Habibullah and information commissioners Satyanand Mishra and Annapurna Dixit ruled on Monday. "More important, if an exercise has indeed been undertaken for declassification as contended by respondent in the hearing, whether a conscious decision has been taken not to declassify the information sought at a sufficiently responsible decision-making level of government and if so, the reasons for arriving at such a decision," the order said. "For this purpose, the commission decided that the records containing the information sought by the appellant need to be perused by the commission and the same be produced before the commission on April 29," it said. During the hearing on March 17, Nayar contended that when he sought the same information from the authorities in Pakistan, he had been denied it simply because of the absence of any such agreement between India and Pakistan to disclose the information to an Indian national and only a Pakistani national could have access to the information. 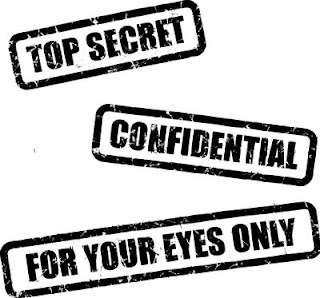 Nayar wondered that when Pakistani authorities "had no objection to parting with the information, which contained Pakistan’s viewpoint", why the same information was treated as top secret here. My article Prophet of Humanism - 100th Anniversary Of Sri Aurobindo’s Arrival In Pondicherry has been published in The Statesman. Click here to read. While India is blissfully dreaming of a great friendship with China, China is building its defense. Let us not fool ourselves, these airport, though 'officially' civilian and not shown in the PRC's defense budget, have a dual use. The PTI article does not take into accounts, other 'civilian' airports in Tibetan-inhabited areas of Qinghai, Gansu, Sichuan and Gansu. 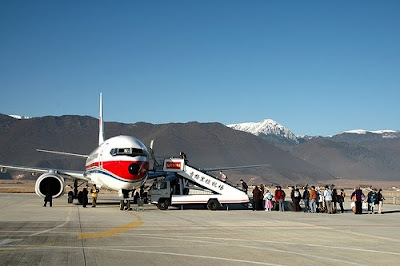 The picture shows the Shangrila airport, today in Yunnan province who received 3 million visitors in 2009. Beijing: Chinese have said that the new airport built near the world's tallest peak Mount Everest in Xighaze in Tibet will become operational in October and would boost tourist traffic in the region, in a move that would enhance its reach closer to Indian and Nepalese border. The airport being constructed at the cost of US $71.7 million was also expected to boost tourist traffic to Xigaze where the Tashilhungpo Monastery headed by the Chinese appointed 11th Panchen Lama Gyaincain Norbu is located. Construction of the Peace Airport in Xigaze prefecture began in April last year and would be completed in September, making its opening in October feasible, said Xu Bo, director of the Civil Aviation Administration's Tibet Branch. The airport would be able to handle 230,000 passengers and 1,150 tonnes of cargos and allow 2,580 take-offs and landings annually by 2020, state run Xinhua news-agency reported. The project will boost investment and tourism in Xigaze, the second largest city in Tibet. Xigaze is home to a group of ancient temples and the world's highest peak, Mount Qomolangma, in Dingri county, it said. It would be the fifth civil airport in Tibet, after those in Lhasa, Qamdo, Nyingchi and Ngari. 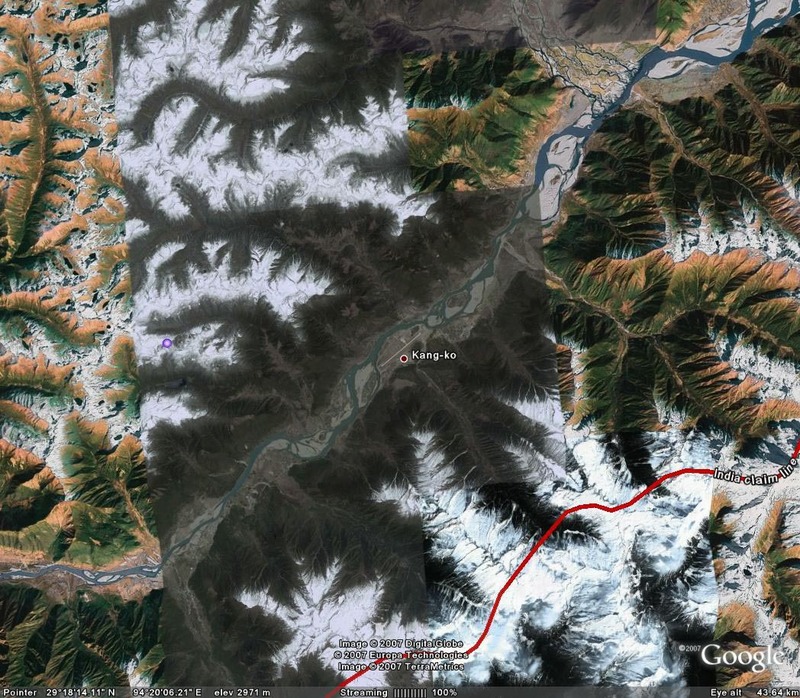 Tibet also plans to build the world's highest airport at an altitude of 4,436 meters in Nagqu Prefecture. China, in recent years beefed up its infrastructure to Tibet connecting it with the mainland both by road, rail and air, raising concerns in India that the extensive net work of connectivity provided tactical advantage for it to deploy troops at the borders in short span of time. The Chinese modernisation drive also prompted India to beef up the infrastructure in Arunachal Pradesh. It requests the Government of India “to address the unlawful confinement of the 17th Gyalwang Karmapa. We petition for his immediate release from confinement in Sidbhari (India)”. One doubts that it will have the desired effect; on the contrary, it is bound to create more doubts in the mind of those who believe that the young Lama is being manipulated from abroad. The probable reaction will be, “If the Karmapa is not happy in India, he is free to go to the US, nobody will stop him”. Unfortunately, he has a point. Zealous supporters should have kept the foreign visit on a low key and not tried to unnecessarily boost the image of ‘their’ leader. In such a case, difficulties are bound to arise. I still remember the first visit of the Dalai Lama in Europe in 1973; at that time there were a lot of doubts in Government circles, but the Tibetan leader did everything to keep it low key. He was wise. Will it be so easy? It may not be as easy for the Chinese that it appears in this article. Remember 1979, the Chinese were supposed to smash the Vietnamese but they ultimately got a 'bloody nose'. And why should the conflict (if it ever happen) be limited to a few days. Further, the Chinese railway line is a very vulnerable link, the local Tibetan population is against them, many dies are in China's disfavour and contrary to 1962, India will use its Air Force. I think that it would be wiser for the country which promotes a 'peaceful rise', not to try. In a medium and long-term, they could only be the looser. However, it is true that India is far behind in terms of infrastructure. Classified military documents on China’s strategy for a limited war against India confirm our worst fears: China can take Arunachal in 48 hours. And we are in no hurry to do anything about it. The PLA has shifted away from the strategy that gave it victory in the 1962 war against India. But even today, the result is unlikely to be much different. 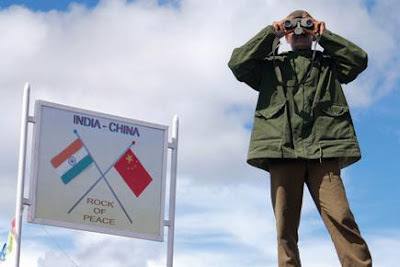 Repeated violations of the Indo-Chinese border lead to an escalation in the war of words, but India continues to believe that the Chinese are following their usual pattern of aggravation and conciliation. Rapid Reaction Forces, comprising 4 divisions stationed at Chengdu and Lanzhou after an overnight mobilisation cross rapidly into Indian territory in Arunachal Pradesh. Indian defences are caught unawares, but the Fifth Mountain Division in Tenga engages the invading forces. They find themselves badly outmatched, not only outnumbered but also out-equipped because the Chinese RRF also include airborne assets. The Indian forces have no immediate airlift capacity to provide back up. Within the next 48 hours Arunachal is overrun. The other Indian divisions in the region need at least a week to reach the zone of conflict. By then, the Chinese have achieved their goal of winning a limited war. The above scenario is no conjecture, it is a plausible outcome of the Chinese doctrine of war against India. The Delhi-based Integrated Defence Staff (IDS), a tri-services institution for planning joint doctrines for the Indian military, in its assessment of Chinese military might, has analysed the Chinese plan for winning limited wars under hi-tech conditions. The document, a copy of which is available with Open, speaks of a Chinese strategy based on the use of RRFs or ‘fist units’ to fight local wars that ‘can achieve the political objective rendering major wars unnecessary’. These fist units are self contained units to be deployed as ground forces in direct combat, and were raised after the People’s Liberation Army (PLA) emphasis on numbers-in-action in a numerically huge army gave way to a capability-driven force. In other words, the PLA has shifted away from the strategy that gave it victory in the 1962 war against India. But even today, the result is unlikely to be much different. Now, instead of overwhelming numbers, it is the rapidity of movement and mobilisation that is likely to overwhelm India, perhaps leading to a scenario no different from what transpired in 1962. These divisions provide a strength of 94,000 men against which India has ranged 9 Mountain Divisions comprising 90,000 men, but most of these would not even enter the conflict. Of the six Chinese divisions, four are airborne RRFs and can be moved within 48 hours on the back of airlift capability granted by Y8, IL-76 and H5 transport planes in the region. With rail and road infrastructure in place, mobilisation time could be further reduced. The Lhasa-Beijing railway line, the highest in the world, would further help in transporting troops and logistics. In contrast, India’s first C-130J transport plane would enter service only in February 2011. As a result, seven of India’s eight mountain divisions in the northeast would be of no use against an offensive as laid out in the Chinese War Doctrine. No armoured or airborne units are part of mountain divisions in this region. Moreover, these units require at least a week to be mobilised, which would be time enough for China to bring its entire force of RRFs to bear against India. The numbers in Chengdu and Lanzhou can be backed up by any of the 19 other RRF divisions across China; given their airlift capabilities, many of them can reach the theatre of operations within a week, which is still faster than what it would take Indian troops located far closer to the action. But the fact is the Indian response to the scenario laid out in documents compiled by its institutions has been slow in coming. India lacks infrastructure in the northeast. The Border Roads Organisation is still in the process of coming up with roads and other structures in the area nearly four decades after the defeat suffered at the hands of the Chinese. An amount of Rs 2,000 crore is now being pumped in for the re-activation of the advanced landing grounds (ALG) in the northeast and Ladakh. In September 2009, in Nyoma, eastern Ladakh, an IAF An-32 transport aircraft landed at the ALG, at an altitude of 13,300 feet, and became the first fixed wing to land at the compact airstrip, which is 23 km from the Line of Actual Control (LAC). Helicopters have been landing at the place, though. Nyoma was re-activated as part of the seven defunct airfields which were to be re-activated, and came after Daulat Beg Oldie and Fukche in Ladakh, which were made operational in 2008. Daulat Beg Oldie is the highest airfield in the world at an altitude of 16,200 feet. But in Arunachal Pradesh, Machuka, Tuting, Paasighat and Along still await re-activation. And it is here that the Indian vulnerability which was so badly exposed in 1962 persists. India had only two divisions of troops in the region of the conflict, and as a result, China registered major gains over India and seized Rezang La in Chushul in the western theatre and Tawang in the eastern theatre. The Chinese strategy was clear: the main assault was launched in the eastern sector, while a simultaneous but smaller assault took place in the western sector. All Indian troops in territories that China claimed belonged to it in the eastern sector were ousted before China declared a ceasefire in November 1962. The Government’s own assessment of the failures of 1962, recorded in the official history of the war, reads: ‘Strategically, Walong, Tawang and the forward areas in Ladakh were indefensible in 1962 against a major attack. But, regarding eastern Ladakh in particular, it is difficult to think up any viable strategy to save it once the Chinese have stolen a march in logistics by quietly building the road through Akshai Chin.’ That is precisely what the Chinese are busy doing now: stealing the march in logistics. India, on the other hand, continues to respond slowly. Two Sukhoi-30 squadrons are planned for Tezpur and one for Mohanbari, but only Six Sukhoi-30 aircraft are flying in Tezpur currently. Six C-130J Super Hercules transport aircraft, which India is buying from the US, are to be based in the northeast, in all likelihood in Jorhat as these aircraft need very little space and can take off and land on short runways. There is no armoured regiment in the east or northeast. The 66 Armoured Regiment at the Indo-Bangladesh border is to be used for any eventuality in the east and northeast, till light tanks are bought for use at high altitudes. The Indian Army plans to buy around 300 light tanks, mainly for the China-centric Karu-based 3rd Division, but plans to increase armoured presence in the North Sikkim plateau are also under active consideration. But even as India gears up to meet the current Chinese threat, China is already planning for the future. As a result, the gap in capabilities is unlikely to shrink, if not grow wider.At the moment, while India has technological superiority in air power, this is also being neutralised by the Chinese. China is inducting 40 Sukhoi 27s and 300 J 10 fighters, 10 IL 78 mid-air refuellers, 4 Awacs and around 4 to 6 airborne early warning aircraft. This will take care of the current imbalance. The addition of 40 IL 76 heavy lift aircraft will bolster their airlift capabilities which will cater to another 48 additional airborne divisions that are being raised this year. In addition, the DIA estimates the Chinese have an additional 500 civilian aircraft for the airlifting of troops. In 1962 as well, the Indian establishment misjudged the intent of the Chinese. The Indian intelligence apparatus told the Government in Delhi that the Chinese ‘were not likely to use force against any of our posts, even if they were in a position to do so’. My article When the most dangerous man came on the occasion of the 100th anniversary of Sri Aurobindo's arrival in Pondicherry was published on Monday in The New Indian Express. You can read by clicking. What could be the reason for the Government of India to refuse to clear the European trip of the 17th Gyalwang Karmapa Ogyen Trinley Dorjee? 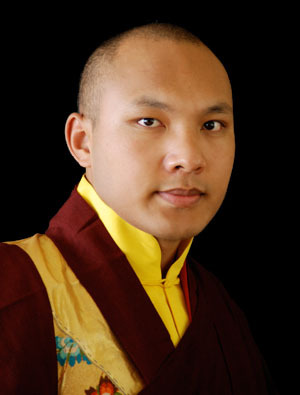 The young Karmapa was scheduled to give a series of teachings in nine European countries from May 27 and July 2, 2010. On Monday, Ven. Ringu Tulku, the tour coordinator conveyed the ‘sad’ news to the Dharma Centres organizing the event in their respective countries. The news was rather surprising because the head of the Karma Kagyu tradition of Tibetan Buddhism had been granted permission by the Government of India to visit the United States last year, between May 15 to June 2, 2008. Everyone remembers how the 15-year old Karmapa, in a Bollywood-type escape reached Dharamsala in January 2001 after crossing the highest Himalayan passes in the midst of winter and the hesitations of the Indian government to grant him refugee status. At that time, many believed that he had been 'planted' by the Chinese to create confusion with the Sikkim issue (Beijing recognized the Indian State as a part of India only two years later). Finally, several days after his arrival, Kalon Tashi Wangdi, then Minister of Religion and Cultural Affairs in the Central Tibetan Administration, Dharamsala declared: "The Government of India has formally communicated to us that the 17th Gyalwa[ng] Karmapa Ogyen Trinley Dorjee has been granted refugee status in India." When asked if the Karmapa would be allowed to travel without any restrictions in India, the Minister then stated that the Karmapa would be "allowed to stay in India as any other Tibetan refugee, we have no restrictions imposed by the Indian government." However, h was not to be ‘any other refugee’, especially after a dispute soon erupted with another Karmapa pretending to the throne of Rumtek monastery, Sikkim. The previous Karmapa, the Sixteenth of the lineage, was one of the greatest Lamas of his generation. He was a great yogi and a realised being. All those who approached him, whether Tibetan, Indian or Western, were greatly impressed by his profound wisdom and the strength and peace emanating from his being. He was respected by all, but when he passed away in 1981, he left his monastery of Rumtek in Sikkim as well as hundreds of Dharma Centres in India and abroad in the hands of four regents who were supposed to provide spiritual guidance to his followers during his absence. Unfortunately, when one of the regents, Situ Rinpoche discovered a letter of prediction said to have been written by the old Karmapa prophesying his rebirth in eastern Tibet and giving the time of birth and the name of his parents, a dispute erupted between Situ and another regent, Shamar Rinpoche who did not approve of Ogyen Trinley Dorjee's selection. This was no ordinary dispute; the two Lamas have been fighting for lives after lives in their successive reincarnations. In fact, Shamar had often been on the wrong side of the fence. It turned so bad that at the end of the eighteenth century, the Tibetan government had to ban the reincarnation of Shamar. He was accused of high treason in a war against the neighbouring Gorkhas. It is only the Sixteenth Karmapa who again re-started the process of recognising the lineage of the Shamar Lama. In Rumtek, bitterness grew between the regents. It took an ugly turn in 1992-93, when law and order problems occurred on a few occasions and a petition was filed in the Sikkim high court praying for an injunction to stop the recognition of the 17th Karmapa. More infighting was reported from Delhi in 1994 when Shamar enthroned his own Karmapa, Thagye Dorjee who is presently living in Europe. In the meantime, after conducting the necessary tests, the Dalai Lama gave his seal of approval to Ogyen Dorjee. About the same time, in Beijing, the Chinese leadership who had the boy in their hands, decided to also recognize him as the 17th Karmapa. It was the first time in the history of a Communist regime that a ‘reincarnation’ (they call it Living Buddha’) was officially recognized. Poor Karl Marx must have turned in his grave! The present Karmapa has the unique privilege to have been acknowledged by both the Communist authorities in Beijing and the Dalai Lama in Dharamsala. Now what could be the reasons for the Indian Government to refuse to clear the Karmapa’s European tour when he was granted permission to visit the US last year? 1- I am told that it was due to the current visit of S.M. Krishna, the Minister of External Affairs to China. The Chinese would have put some pressure on the Ministry to cancel the Karmapa’s forthcoming visit. Always avid for scoops, the media has recently projected the Karmapa as the probable successor of the Dalai Lama. The pressure factor on the Ministry is however doubtful as the Karmapa’s visit was expected to take place some two months after the return of the Minister to South Block. What would Delhi gain out of such gesture of appeasement? In any case, whether it is Obama, Sarkozy or Krishna, nobody has ever gained anything in appeasing Beijing. Nirupama Rao and her colleagues should know that these gestures bring, at the best, very short-term gains. 2- Perhaps more serious is the fact that from the day the Karmapa arrived incognito in Dharamsala in 2001, many Indian officials have been convinced that he had been ‘planted’ by the Chinese intelligence to create some mischief in India, more particularly in Sikkim. This belief probably still exists amongst a few officers in the Security agencies, though during the last 9 years, they have had ample occasion to check the ‘genuineness’ of the young lama. This theory however does not explain why last year’s US visit was cleared and not the European one. 3- Another possibility is pressure from the ‘other’ Karmapa’s camp. Dharma Centers are big business in the West and Thagye Dorjee probably considers Europe as his own turf. He is said to live in Germany and to often travel to other European countries. In the past, the Shamar group has been very well connected with several senior officials in the Indian Government. Has Shamar pressurized some officials in Delhi to cancel the visit of the Karmapa to Europe? It is very possible. A rumor circulated a couple of years ago that when the present Karmapa visited Shamarpa in Delhi, where he resides, the latter would have proposed a ‘deal’ to the young Karmapa: “You look after India, Thagye Dorjee will look after Europe”. It is probably a gossip (though perhaps with some truth in it, at least from Shamarpa’s idea to ‘share’ the world). It would therefore be logical for him to have tried to block the Karmapa’s visit to Europe. 4- Another possibility is that the Government would have received the information that some Chinese agents or supporters of Shamarpa’s Karmapa would have infiltrated one or several of the Dharma Centers to be visited by the Karmapa. This type of information, if available with the Government of India, would hopefully be passed on to the host country (or vice-versa, if the host country had information that the life of Karmapa was in danger). In which case, the easiest way was perhaps to cancel the tour. 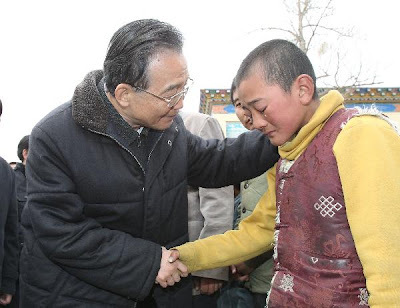 5- A story has recently circulated that the Chinese leadership was seriously preoccupied by the diplomatic activities of the Dalai Lama and more particularly in two countries, the United States and France as both Presidents, Obama and Sarkozy, have met the Tibetan leader. The rumour said that the PLA Intelligence was ready to dispatch ‘operational’ agents to countries to be visited by the religious leader in order to study the ‘local’ conditions. Their role would be to find the most appropriate country to create mischief. Of course, the news is probably part of the web-gossip mill, but by stretching one’s imagination, one can think that the Karmapa would be an easier target than the Dalai Lama, as he probably does not benefit of the tight State security offered to the Dalai Lama while touring abroad. For the Chinese, it would be an easy way to get rid of a possible successor to the Tibetan leader at a time when they are betting on their own Panchen Lama, who they recently sent as a delegate to the Chinese People's Political Consultative Conference, to succeed the Dalai Lama. 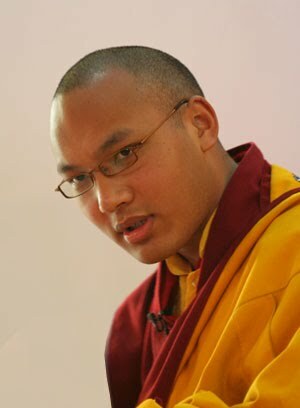 Of course, all these points are difficulty verifiable, but one hopes that the organizers who have invested a lot of time, money and energy to receive the Karmapa in Europe will be informed of the real reasons behind the cancellation, so that they can find a remedy and get the blessings of this bright young Lama, so much interested in protecting the environment. I am sad to announce that the proposed visit of His Holiness the 17th Gyalwang Karmapa Ogyen Trinley Dorji was not approved by the Government of India. The visit was scheduled to take place from 27th May to 2nd July in nine countries of Europe. The Kagyu Office, the Administration of Gyalwang Karmapa was informed of the decision by the Tibetan Government in Exile on 3rd April 2010. The process has begun to find out why this visit was not possible and what positive conditions are needed to make the visit possible in near future. I know a huge number of followers and friends in Europe were eagerly waiting for the visit of Gyalwang Karmapa and I know that all of you are sad and disappointed. I would like to take this opportunity to thank all the organizers, volunteers and donors for working so hard to prepare for the visit in last many months. Your cooperation and support were beyond any expectations. I hope and pray together with you that the visit will happen in very near future and that all of us would be able to receive his teachings in Europe. Why has the Government of India refused the permission to the Karmapa Ogyen Trinley Dorji to tour six European countries? This excellent article of Willy Lam for the China Brief of the Jamestown Foundation should be read with a report prepared in 2007 by the Central Tibetan Administration of the Dalai Lama. "The first natural resource to be consumed in a modern way was the great forest of eastern Tibet. This is the best watered part of Tibet, and has long had mature forests of spruce, fir, juniper, larch, cypress, oak, bamboo and rhododendron on its steep slopes, perched above the wild mountain rivers that rush toward lowland Asia. These forests have served many purposes to Tibetans for centuries. They were sustainable sources of shelter, rest, firewood, mushrooms, medicinal plants and construction timber. While the nomads may have occasionally cleared a section of forest in order to expand their pastures, they preserved the majority of the forest, especially on the northern face (Daniel Winkler). Following the Chinese occupation, chainsaws tore into the Tibetan forests all through the 1960s, 1970s, 1980s and well into the late 1990s, clearing whole valleys of all their trees without exception, and leaving the mountain slopes without protection from erosion. The felled trees were often simply slid into the rivers, to be recovered downstream in lowland China. Innumerable logs were damaged or smashed en route by the wild mountain rivers, making their sacrifice senseless. It was not until the disastrous floods of the middle and lower Yangtze river in 1998, a year of average rainfall, that China realised it was paying the price of stripping Tibet’s forests. Only after the forests had been almost entirely stripped did the logging finally stop in the name of water conservation. China had to choose between Tibetan timber and Tibetan water, and decisively chose water, which cannot be imported. Logging does continue today, but on a lesser scale. Some of it occurs legally and some by ingenious methods of flouting the law, such as deliberately starting forest fires so that the leaves are burned and the trees die, while the valuable trunks remain standing. The trees are then officially declared useless, and are free to be harvested. Chinese occupation, chainsaws tore into the Tibetan forests all through the 1960s, 1970s, 1980s and well into the late 1990s, clearing whole valleys of all their trees without exception, and leaving the mountain slopes without protection from erosion. The felled trees were often simply slid into the rivers, to be recovered downstream in lowland China. Innumerable logs were damaged or smashed en route by the wild mountain rivers, making their sacrifice senseless. It was not until the disastrous floods of the middle and lower Yangtze river in 1998, a year of average rainfall, that China realised it was paying the price of stripping Tibet’s forests. Only after the forests had been almost entirely stripped did the logging finally stop in the name of water conservation. China had to choose between Tibetan timber and Tibetan water, and decisively chose water, which cannot be imported. Logging does continue today, but on a lesser scale. Some of it occurs legally and some by ingenious methods of flouting the law, such as deliberately starting forest fires so that the leaves are burned and the trees die, while the valuable trunks remain standing. The trees are then officially declared useless, and are free to be harvested." 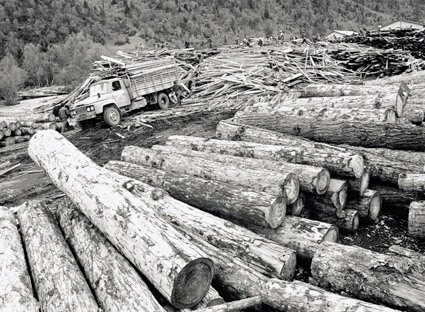 Decades of wild logging in Tibet is certainly responsible for the Karma of China today. Even supposing that the will of the PRC is there, it is not easy to undo what has been done.Nature has a memory of what has been done to her. China’s Ecological Woes: Drought and Water Wars? Are there policy and administrative failures behind the unprecedentedly severe drought that is devastating China’s southwestern provinces? The same question is being asked about the unusually ferocious sandstorm that blanketed northern and eastern China last week. The country’s ecological degradation has had dire global consequences. Dry conditions in Yunnan—a province through which the upper reaches of the Mekong river flow—have been blamed for the depletion of the once-mighty waterway that serves as a lifeline for 65 million residents in the downstream nations of Thailand, Laos, Cambodia and Vietnam. And as sand and dust particles from northern China spray across Taiwan, South Korea and Japan, unless the Chinese government can reassure its neighbors that it is taking effective measures to improve the environment, the “China threat” theory could assume a chilling new dimension. Drought in the five southwestern regions of Yunnan, Guizhou, Guangxi, Sichuan and Chongqing has affected the livelihood of more than 50 million farmers. Crop and livestock losses have exceeded 24 billion yuan ($3.51 billion). Twenty-three million people are reportedly running out of drinking water. In the worst hit regions of Yunnan and Guizhou, each resident is rationed a mere 7.5 kg of water a day. There are also signs the arid conditions are spreading to Hunan, Guangdong and other central and eastern provinces (Xinhua News Agency, March 26; Guangzhou Daily, March 23). So far, the Chinese Communist Party (CCP) administration has sought to reassure the public on several fronts. Firstly, meteorological officials have insisted that the drought is solely caused by unusual weather patterns including global warming and the El Nino effect. Last week, the People’s Liberation Army (PLA) joined water-conservancy and disaster relief departments in providing aid to the victims. Moreover, while the drought has affected some 111 million mu (7.4 million hectares) of land, this represents only 6 percent of China’s total arable acreage. The National Development and Reform Commission (NDRC) reiterated that food shortages would be limited—and unlikely to raise the inflation rate significantly (Xinhua News Service, March 25; People’s Daily, March 24). Independent experts as well as commentators in relatively outspoken media, however, have zeroed in on so-called “man-made disasters” behind this natural catastrophe. A series of policy errors has, for the past two decades, upset the delicate ecological balance in southwest China, which until the 1980s boasted some of China’s lushest forests and richest bio-diversity. Well-known water researcher Ma Jun believes that “man-made factors have contributed to the drought...for example, deforestation has caused serious soil erosion and pollution has destroyed limited clean water resources” . 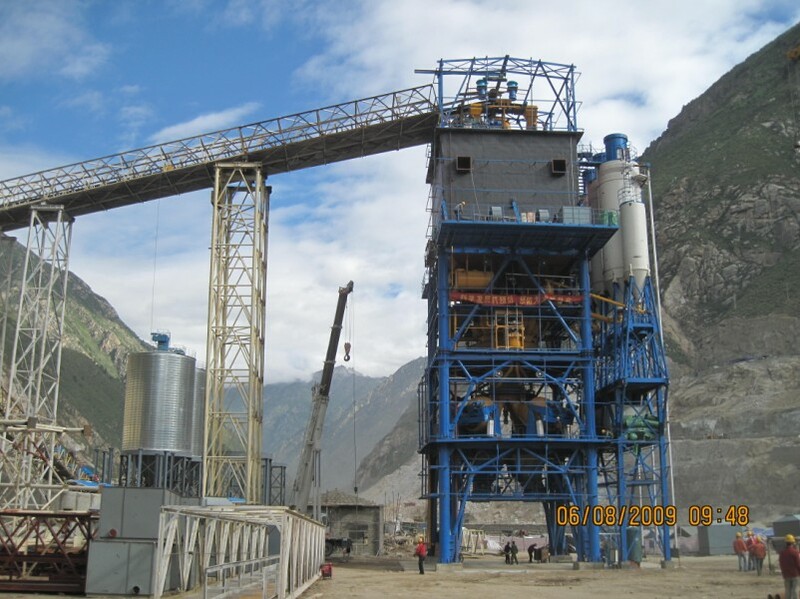 Environmentalists have decried how, in response to rising energy prices, politically well-connected state-run corporations have scrambled to build dams in Yunnan and neighboring provinces to exploit hydro-electric power. These massive projects have exacerbated deforestation and brought about changes in the microclimate of nearby areas. Ecology and conservancy expert Wang Weiluo argues that the more water that is stored in reservoirs dedicated mainly for hydropower purposes, the less water will be lodged under the fields of farmers. This is one reason why the water table in the southwestern regions has sunk to alarming levels. In different parts of Yunnan and Guizhou, well-diggers have to bore through more than 70 meters of parched subsoil before hitting water (Sina.com.cn, February 22; Beijing Youth Daily, March 26). Secondly, Yunnan provincial authorities have, since the late 1990s, been urging farmers to cut down trees to make way for more lucrative rubber and eucalyptus plantations. Rubber, eucalyptus and associated crops, however, use much more water than rice or wheat. Writing in the official New Beijing Post, environmental activist Wang Yongchen describes rubber and eucalyptus plantations as super-efficient dehumidifiers and “water-sucking machines.” These cash crops, together with rapid industrialization, have “upset man’s relationship with nature in southwest China,” Wang noted. A recent report in Shanghai’s mass-circulation Xinmin Evening Post quoted officials in Yunnan’s Water Conservancy Department as saying that “for a long period, no maintenance work has been done to small-scale reservoirs and water-storage facilities.” Similar to counterparts in the rest of China, officials in the southwest regions often use funds earmarked for water projects to invest in manufacturing, real estate and even stocks and shares (China News Service, March 23; Xinmin Evening Post, March 22; New Beijing Post, March 23). Drought conditions have exacerbated the scourge of desertification, which is claiming a million acres of land every year. One third of the entire country’s land mass suffers from some degree of desertification, up from 27 percent in 2004. The sandstorm last week, which hit 16 provinces and made life difficult for 20 percent of China’s population, has belied claims by officials that the rate of desertification slowed down markedly by the year 2000 (Time, Asia Edition, March 22; Al Jazeera News, November 6, 2009). According to Han Tonglin, a researcher in the Chinese Institute of Geological Sciences, the immediate cause of the sandstorm was gale-force wind whipping up sand and dust from several dried-up salt-water lakes in Inner Mongolia and neighboring areas. Han said the disaster had cast doubt about the efficacy of the 100 billion yuan ($14.64 billion) that the central government had spent over the past decade on schemes to impede the desert’s progress. Apart from planting saplings, such efforts have included using cash incentives to persuade farmers and livestock rearers to switch to conserving grasslands and growing trees. Han and other scientists have also blamed poor coordination among the Ministries of Agriculture, Forestry, Water Conservancy and Environment Protection for dearth of national leadership in the Herculean struggle against sandstorms (Ming Pao [Hong Kong], March 25; Cable TV News [Hong Kong], March 28). There are indications that in this fast-shrinking globe, China’s ecological problems are straining its ties with neighbors. As water levels in the 4,350-kilometer Mekong fall to their lowest in 50 years, four riparian countries—Thailand, Laos, Vietnam and Cambodia—have called on Beijing to take immediate steps to save the “Mother River.” Senior ministers from these four nations, all of which are members of the Mekong River Commission (MRC), are scheduled to meet on April 3 in the Thai coastal town of Hua Hin (Reuters, March 25; AFP, March 26). Ecologists in the MRC countries say the three mammoth hydropower dams in Yunnan have exacerbated the Mekong’s woes. They have urged the Chinese government to release more water from the dams—and to halt up to eight new hydroelectric projects. While Beijing has agreed to send a delegation to the Hua Hin conference, it has insisted that its dams have nothing to do with the lowering of the Mekong’s levels. Moreover, officials in Beijing and Yunnan have asserted that the Lancang (the Chinese name for the upper reaches of the Mekong) only contributes 13.5% to the Mekong’s volume. In an apparent effort to absolve their country of responsibilities, Chinese authorities recently agreed to provide the MRC with daily hydrological data from monitoring stations at two major Lancang dams (Al Jazeera News, March 8; Bangkok Post, March 25). The intensifying confrontation over the Mekong river has thrown into sharp relief other “water wars” that could erupt between China and its neighbors. Glaciers from the Tibetan highlands form the fountainhead of 10 rivers that flow into 11 countries. 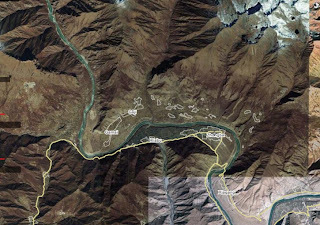 In the past two years, Beijing and New Delhi have been at loggerheads over plans by the Chinese government to siphon off water from the Yarlung Tsangpo River to feed into canals designed to irrigate China’s central and Northern provinces. After crossing the China-India border, the 2,057-kilometer-long Yarlung Tsangpo becomes the Brahmaputra, the primary source of water for the North Indian states of Arunachal Pradesh and Assam as well as Bangladesh. 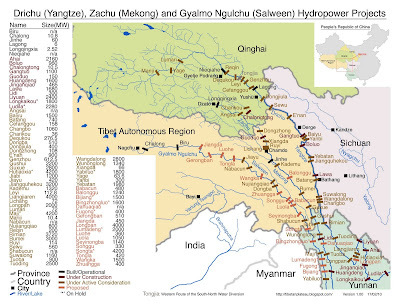 The water diversion project, in addition to plans to build one of the world’s largest dams over the Yarlung Tsangpo, could deplete the Brahmaputra. Given Sino-Indian disputes over border delineations in Arunachal Pradesh, which is called South Tibet in China, a mutually agreeable settlement to their water disputes seems unlikely at least in the near term. Indeed, under China’s multi-billion dollar South-North Water Diversion Scheme, some 40 billion cubic meters of water will be redistributed annually from the Tibetan plateau to arid regions in northern China (Asiasentinel.com [Hong Kong], January 19; Assamtimes.org [India], November 5, 2009). At least superficially, the international impact of the sandstorm, which hit most of Taiwan, Japan and South Korea on March 21, has been less pronounced. This is despite the fact that tens of thousands of residents in cities including Seoul and Tokyo had to wear surgical masks against the sudden invasion of grit and dust. Six domestic flights in the eastern Japanese city of Kobe were delayed. While neither Tokyo nor Seoul has publicly raised the issue with Beijing, popular Japanese and Korean websites were replete with remarks attacking the Chinese government’s mismanagement of its ecology. Critics have also fingered China-originated acid rain that has periodically fallen on the two neighboring countries (China News Service, March 22; Central News Agency [Taiwan] March 21; Apple Daily [Hong Kong] March 23). At a time when the CCP leadership under President Hu Jintao has pulled out all the stops to embellish China’s image and to project Chinese soft power worldwide, the quasi-superpower’s apparently irresponsible environmental policy could add a disturbing new dimension to the “China threat” theory. 1. Author’s interview with Ma Jun, March 25, 2010.
Who will fulfil Aurobindo's dream? My article on Sri Aurobindo and the French University in Pondicherry titled Who will fulfil Aurobindo's dream? is posted on Sify.com website. Click to read. After Google, that is Dylan's turn to be censored. HONG KONG — Bob Dylan has cancelled several legs of an Asian tour after Beijing refused to give him permission to perform in China, a newspaper reported Sunday. Dylan originally planned to play in China, Hong Kong and Taiwan, following his multi-city tour of Japan last month, the Sunday Morning Post said. 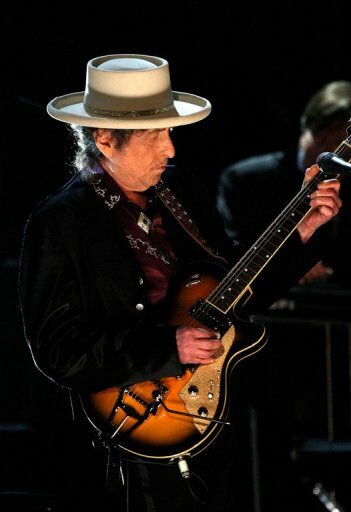 Tour organisers, Taiwan-based Brokers Brothers Herald, announced in January that Dylan would be performing in Hong Kong on April 8, but there was little subsequent promotion, the report said. When permission for dates in Shanghai and Beijing was not granted by the Chinese government, the company pulled the other Asian dates. "China's Ministry of Culture did not give us permission to stage concerts in Beijing and Shanghai, so we had no alternative but to scrap plans for a Southeast Asian tour," Jeffrey Wu, the promoter's chief of operations, was quoted as saying. "The chance to play in China was the main attraction for him. When that fell through everything else was called off." Telephone calls to the ministry by AFP went unanswered on Sunday. Wu said the ministry had tightened control over foreign singers performing in China since Icelandic star Bjork's pro-Tibet outburst at a Shanghai concert two years ago. The ministry said Bjork "hurt the feelings of Chinese people" after she chanted "Tibet! Tibet!" when singing her song "Declare Independence." China has ruled Tibet since sending in troops in 1951 to "liberate" the region. It has grown increasingly wary of pro-Tibetan independence campaigns after protests staged two years ago in the Tibetan capital Lhasa to mark the anniversary of the March 10, 1959 uprising erupted in deadly violence. Dylan is best known for the politically charged songs of his early career, including "The Times They Are A-Changin'" which is hailed by some critics as the archetypal protest song. His anti-war anthem "Blowin? in the Wind" is still regularly played at peace demonstrations. The Last Message of Sri Aurobindo?